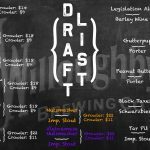 The Willoughby Brewing Co. is the perfect place to host your next event. Everything from baby and wedding showers, birthday parties, graduation parties, business meetings and more. We can accommodate you and your guests with our exceptional service, wide array of food options, and we can meet just about any request you may have. Also, don’t forget that we are the perfect venue for your next fundraiser. Whether you are looking to host an event with live music or just have a smaller get-together to help your favorite cause, we are the perfect spot. We are able to host groups as small as 20 and can accommodate large groups of up to 300 people. We want our guests to be able to arrive and enjoy their event while we do all the heavy lifting. To check availability and to get some personal assistance planning your next event, please call. Depending upon your event, a room fee of $125 as well as minimum food spend may be required to book the Private Dining Room. $200 food spend is required to reserve this area. $300 food spend is required to reserve this area. – Spaces will be available for decorating. Speak to your coordinator to arrange a setup time. – All menus need to be finalized 7 days prior to your event. Pricing effective starting June 21st, 2016. All pricing is set per person and does not include 20% service charge or current sales tax of 7%. Prices subject to change. Please call for current pricing. Download our Banquet Menu here. 🥥🥜🥊 we have a few left. Hurry in!